(ForUm) – In 2013 Kazakhstan will halt to transit grain through the Black Sea, the president of the Grain Union of Kazakhstan Nurlan Tleubayev said during the video bridge Moscow-Kyiv-Astana Food Security: forecasts, risks, concerns, ForUm correspondent reports. The port of Aktau is situated on the eastern coast of the Caspian sea and is only one sea port of the Republic of Kazakhstan, aimed for international shipping of different dry cargos, crude oil and oil products. In 1999 several projects were launched for facilities renewal, the improvement of the port infrastructure and management structure. “I want to say to my colleagues from Russia and Ukraine: we will await further 12 months and starting from harvest 2013, we will refuse to be your competitors in the Black Sea region. And I will not go back on my words,” Tleubayev said. Aktau, formerly known as Shevchenko (1964-1991), is one of the biggest cities of western Kazakhstan, and the country’s only seaport on the Caspian Sea. It is located on the Mangyshlak Peninsula and is the capital of Mangystau Province. 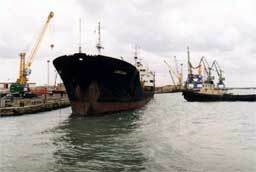 Aktau has an international airport, a railway station, and a developed seaport.